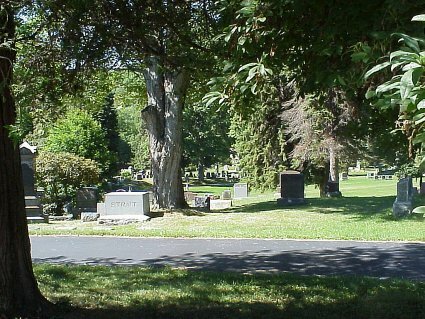 Eaton Henry J. and Louise Corran buried in Corning, N.Y..
Eberenz * a stone base with monument gone and footstone with R.E. Eberenz Carrie D. Apr. 12, 1860 Sept. 23, 1885 wife of Wm. B.
Eberenz Lettie May2, 1867 Aug. 22, 1899 wife of Wm.B. Elsworth Footstones for Father, Mother, Emma Edward and Peter C.
English * W.W.2 flag ??? ENGLISH A tall shaft with inscriptions on all sides. English Charley July 7, 1874 Aug 31, 1881 son of James S &Nancy E.
English James E. 1833 1910 Co. K. 207th Reg. Pa. Vol. English James E. 1833 1910 Co. K. 207 Reg. Pa. Vol. English Robbie W. Aug. 16, 1874 7y son of Wm. & Emma E.
English Robbie W. Aug. 16, 1874 7y son of Wm. W. & Emma E.